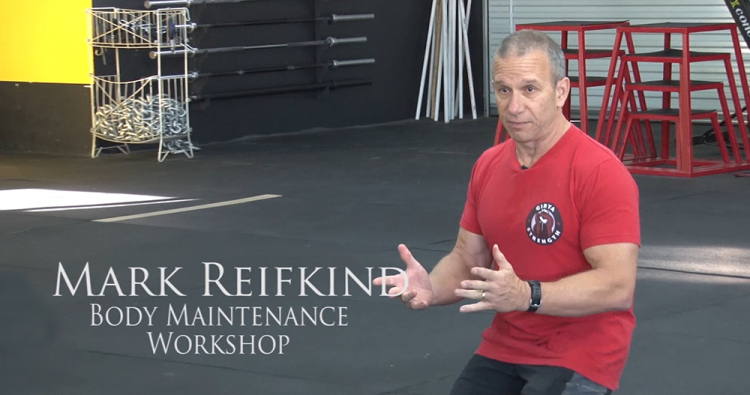 For Mark Reifkind, the important concept of tissue quality has been overlooked for too long. If foam rolling or whatever else you’re doing is not making things softer and better, then you are going too hard. I like to say that foam rolling and similar techniques let the pain out. Now, that’s kind of a joke—the idea is not to increase the pain. The idea is to release the pain. If whatever you’re doing is not making things softer and better, then you are going too hard. The idea being that while the foam roller and these techniques are to make things a little bit easier, they are a little bit painful. You get a papercut, and you say, “That’s painful.” And you cut yourself and you need 15 stitches, that hurts too. So which one is painful and which one is not? It’s a spectrum. How many of you like stretching? Okay, You’re all different . . . because most people hate stretching. That’s the hardest part of my job as a trainer—getting people to stretch. And the hardest thing about stretching is breathing and that breath control. People go into panic mode very quickly because they don’t have control of their breath, which carries over to the rest of your life as well. So we have tonic and phasic muscles and then we have the concept of tissue quality, which has been missed for a long time. Tissue quality is very important. Because your muscle tissue should resemble raw meat. Not beef jerky. Tissue quality relates to the level of tone and tension in the muscles. You should be able to have softness in the muscles, contract them hard when you want to, and then release them. If you are walking around in a semi-contracted state, that’s not optimal. Not optimal for circulation, for movement, etc. With tissue quality, we have two other issues: We have muscle tissue and fascial tissue—connective tissue. It’s all connected in one sense, but they’re separate. Muscle is elastic in nature, like a rubber band. Fascia is plastic in nature—the first line in flexibility. The surfaces underneath the skin should slide and glide. If everything is stuck together, and it doesn’t slide and glide, it needs to. Instead it pulls along the line. Imagine you pull on the bottom of a hammock . . . the top of the hammock moves. That’s how your body is connected. Not just from linkages of muscles, but fascial lines.